"When you're in New York" the sculptor Louise Nevelson once said, "you're in perpetual resurrection." She might have said the same thing about St. Peter's Lutheran Church, set in the heart of midtown Manhattan. In the 1970s the church made a radical move, scrapping its neo-gothic building for a sleek modern structure in the shadow of a skyscraper. The transformation was not just architectural. Inside, Nevelson created a shimmering chapel, while over the years artists and designers such as Willem de Kooning, Kiki Smith, and Massimo and Lella Vignelli produced works for the sanctuary. This fusion of modern art, architecture, and design was complemented by an innovative jazz ministry, including funerals for Billy Strayhorn and John Coltrane, and performances by Duke Ellington and other jazz legends. For the first time, this volume examines the astounding cultural output of this single church. 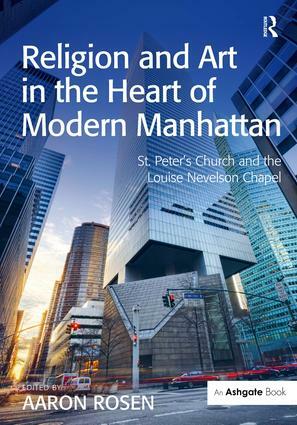 Just as importantly, the story of St. Peter's serves as a springboard for wider reflections on the challenges and possibilities which arise when religion and art intersect in the modern city. Working from a wide range of disciplines, including art history, theology, musicology, and cultural studies, a distinguished group of scholars demonstrate that this church at the center of New York City deserves an equally central place in contemporary scholarship. Dr. Aaron Rosen is the Lecturer in Sacred Traditions & the Arts at King’s College London. He is the author of Imagining Jewish Art and Art and Religion in the 21st Century.